This is Part 3 in a series of conversations with scholars in the F. A. Hayek Program for Advanced Study in Philosophy, Politics, and Economics at the Mercatus Center at George Mason University. Read the first two parts here and here. In this installment, I am joined by Peter Boettke, University Professor of Economics and Philosophy at George Mason University and Director of the Hayek Program. In this conversation, Pete and I discuss the foundations and continuing importance of the Bloomington School of institutional analysis and development. The research tradition established by Elinor Ostrom, Vincent Ostrom, and other scholars in the Workshop in Political Theory and Policy Analysis at Indiana University Bloomington (hereafter “Bloomington School”) has been getting a lot of attention lately. This is particularly true since 2009, when Bloomington School co-founder Elinor Ostrom became the first and only woman to win the Sveriges Riksbank Prize in Economic Sciences in Memory of Alfred Nobel (often referred to as the Nobel Prize in Economics). The Bloomington School’s work on urgent contemporary policy issues such as environmental regulation, natural resource management, and the provision of policing services is also of immediate relevance today. Vincent Ostrom, Elinor’s research partner and husband, first became interested in the question of water rights management when teaching high school in California in the 1940s. The question of how so many people can draw upon the same resource without leaving it ruined or overdepleted became a defining theme of their work. Over the next 60 years, they conducted and inspired a wealth of research on how communities around the world actually engage in the management of their aquifers, fish populations, irrigation systems, forests, and other natural resource systems. Their work, however, extends far beyond the domain of natural resource management. 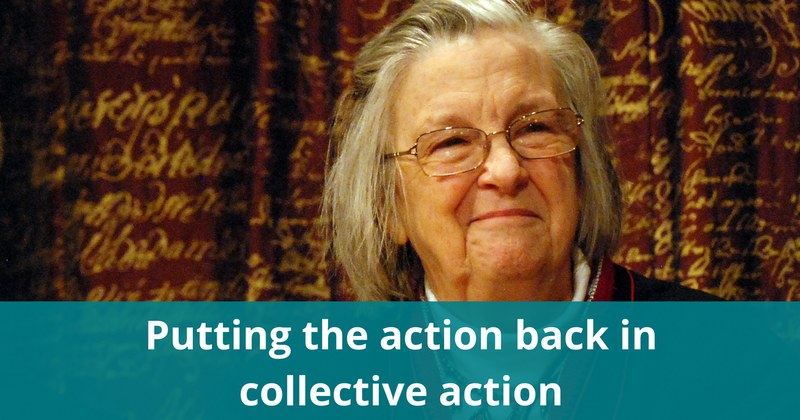 Over the course of their careers, Elinor Ostrom, Vincent Ostrom, and their colleagues studied constitutions, law and order, local public services, and other collective goods of various sizes and forms. These diverse collective goods have some characteristics in common that make them amenable to being studied with similar tools and frameworks. One commonality is that collective goods are provided within complex environments that are constantly changing, often in unpredictable ways. Another is that collective goods require the willing and honest collaboration of many individuals in order to keep them functioning smoothly. Consequently, all manner of collective goods are subject to a potential collective action problem. Put simply, the collective action problem emerges when people fail to act in ways that would create significant public benefits because they perceive those actions to be personally costly. This is most easily understood through an example. Say all of the people on your street agree they would be happier if they cleaned up after their own dogs, even though this means everybody individually has to do a dirty job. Your neighbors don’t mind carrying around little baggies of doggie business until they can find a trash can because they know everybody else is doing the same and the street will stay clean as a result. The problem is that each person knows it won’t really make that much of a difference if he or she doesn’t clean up after Fido just this one time. Chances are nobody will even notice, and the street will still be safe to walk on because the others are cleaning up after their pets. This is known in social science as free riding (and, in most neighborhoods, as being a schmuck). And the real problem starts when too many people on the block decide to go down the free-riding path and the street becomes filthy again, despite the fact that all still agree that cleaning up after our pets would be better. There are a few ways to resolve a collective action problem like the one described above. First, neighbors can use social norms, such as shaming, to try to convince others not to be “that guy” who doesn’t clean up. Religious and other close-knit communities often use this type of comprehensive social pressure to great effect. Second, the people in the neighborhood can self-govern by coming up with a set of rules — including either a system of oversight or a set of punishments that can legally be carried out, or perhaps both — and committing to holding each other to both cleaning up and carrying out any necessary correction. A neighborhood watch could be an example, or a dog-walking club that encourages people to go on group pet walks so others will be around when pet owners are making the great decision: to pooper-scoop, or not to pooper-scoop? Third, government entities can create a law or regulation, using their privileged access to punishments not permissibly exercised by private citizens (such as imprisonment), to ensure that all of those in the neighborhood pick up after their dogs, even if that must be done forcibly. The complexity of the environment within which collective action takes place, and the fact that the rules actually in use within a particular group can be different from the formal written rules, both speak to the importance of understanding the incentives and constraints in effect as they are perceived by the people on the ground. Rather than looking out from the ivory tower, the Bloomington School emphasized getting out into the field and understanding the world as it is, not as the scholar or student wishes it would be. Instead of theorizing about how people get their neighbors to clean up after their dogs, the Bloomington School approach would suggest going out into the neighborhood to ask, listen, and watch. The students and practitioners of the Bloomington School are dedicated to getting out into the field to listen, observe, and even participate in the process of self-governance. They have conducted studies on police services by riding around in squad cars. They have traveled around the world to study the local governance of forests and aquifers. Vincent Ostrom even participated in the Alaskan Constitutional Convention. Trying to understand the world as it is may not be easy, but it’s an admirable endeavor. If you’re interested in learning more about how the scholars of the Bloomington School and those they’ve inspired have attempted the task, you can listen to my full conversation with Pete below and sign up to be notified when future conversations are posted here. If you’d like to take a step further, you can read here about the fellowships and other opportunities available to study institutional analysis and other core ideas in political economy through the Mercatus Center.